Bug Club: The Teacher & Head Teacher Experience Please click the image below to play a You. 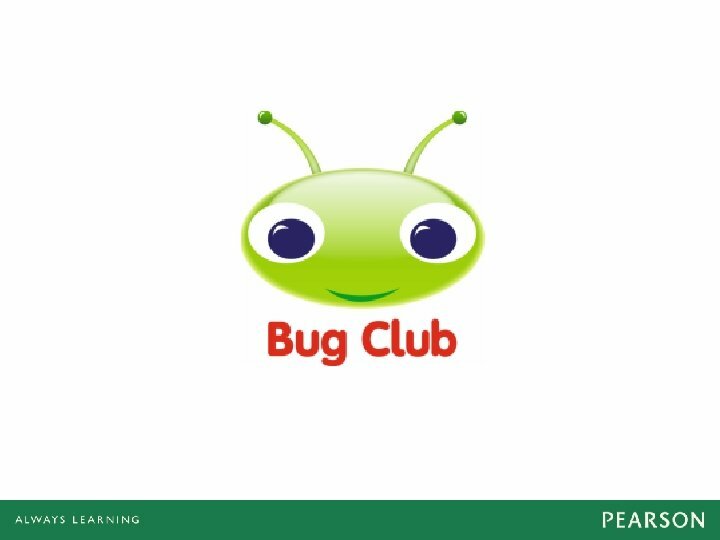 Tube video about Bug Club from Pearson which includes information on teacher, child and parent experiences: * Please note that due to rights restrictions not all the titles featured in the video will be available in your territory. 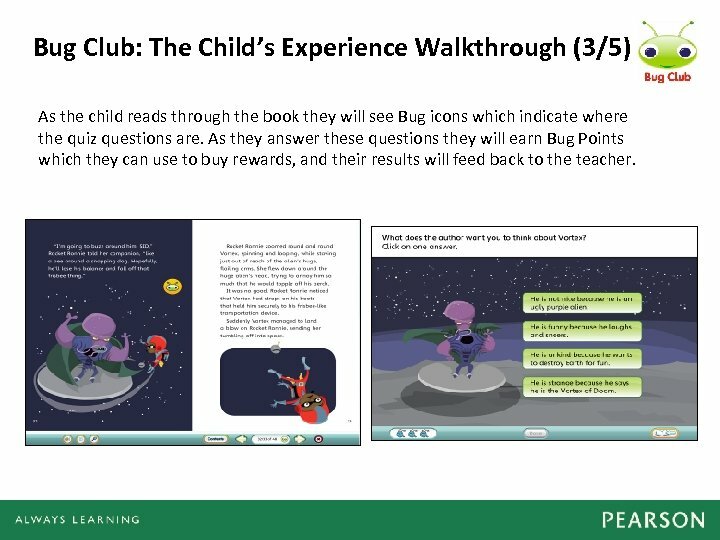 Bug Club: The Child’s Experience Walkthrough (1/5) When a child logs in to Bug Club they see their homepage. Each age group has a different home page: The child will see e. Books on their homepage, and will have up to 5 new e. Books at one Time depending on how many the teacher has allocated. 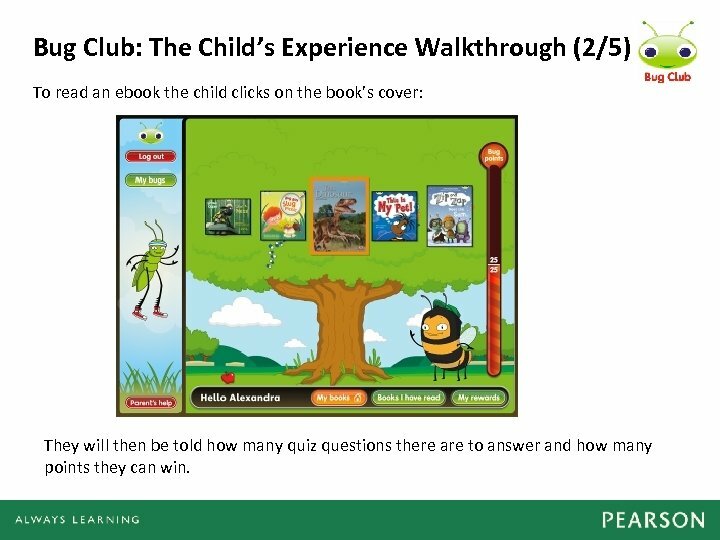 Bug Club: The Child’s Experience Walkthrough (2/5) To read an ebook the child clicks on the book’s cover: They will then be told how many quiz questions there are to answer and how many points they can win. 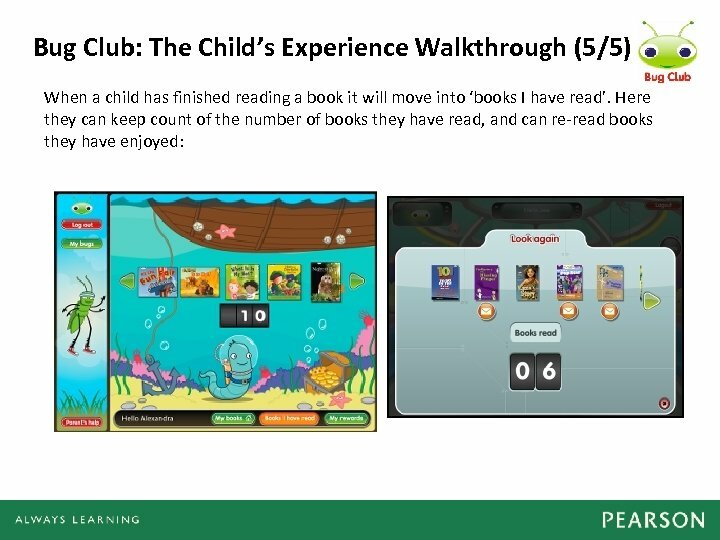 Bug Club: The Child’s Experience Walkthrough (3/5) As the child reads through the book they will see Bug icons which indicate where the quiz questions are. As they answer these questions they will earn Bug Points which they can use to buy rewards, and their results will feed back to the teacher. 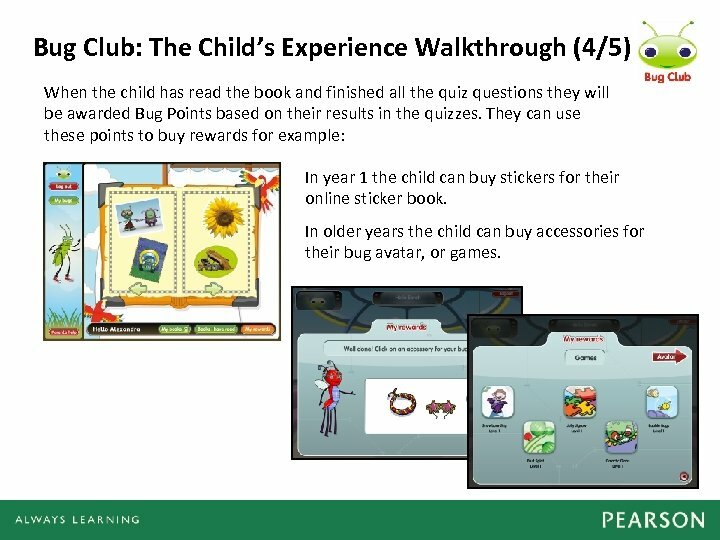 Bug Club: The Child’s Experience Walkthrough (4/5) When the child has read the book and finished all the quiz questions they will be awarded Bug Points based on their results in the quizzes. They can use these points to buy rewards for example: In year 1 the child can buy stickers for their online sticker book. In older years the child can buy accessories for their bug avatar, or games. 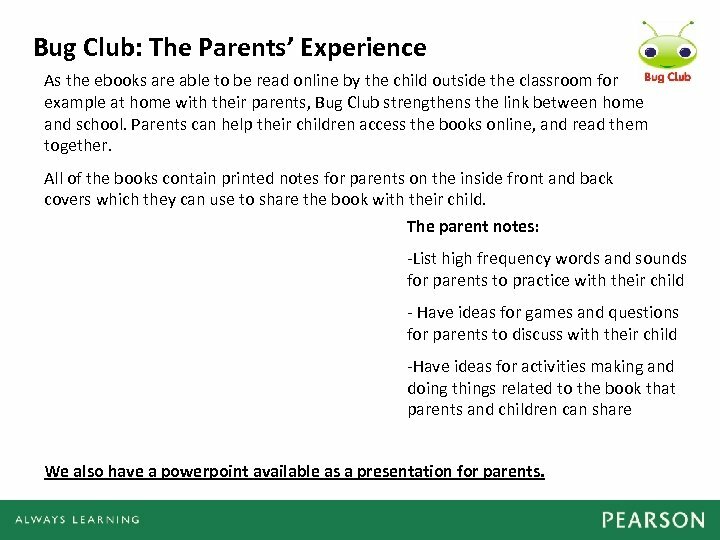 Bug Club: The Parents’ Experience As the ebooks are able to be read online by the child outside the classroom for example at home with their parents, Bug Club strengthens the link between home and school. Parents can help their children access the books online, and read them together. All of the books contain printed notes for parents on the inside front and back covers which they can use to share the book with their child. The parent notes: -List high frequency words and sounds for parents to practice with their child - Have ideas for games and questions for parents to discuss with their child -Have ideas for activities making and doing things related to the book that parents and children can share We also have a powerpoint available as a presentation for parents. What are book bands? All the books in Bug Club are graded by reading levels known as book bands according to the Institute of Education publication Book Bands for Guided Reading. Each Book Band has its own colour. 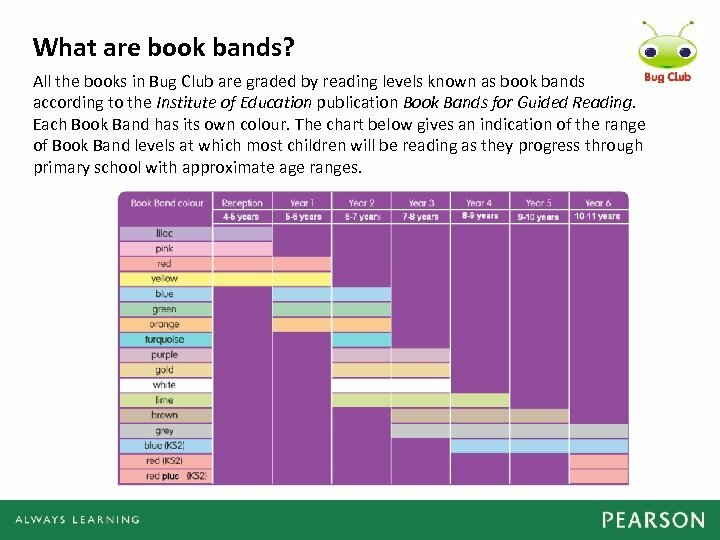 The chart below gives an indication of the range of Book Band levels at which most children will be reading as they progress through primary school with approximate age ranges. How many books are at each level? 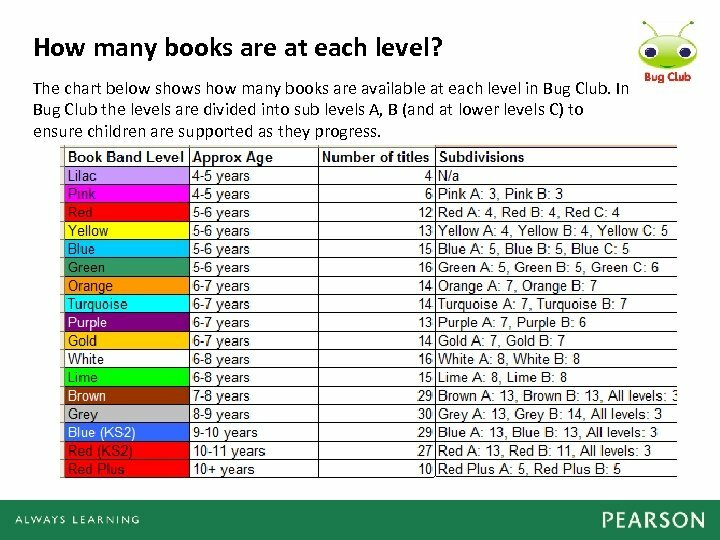 The chart below shows how many books are available at each level in Bug Club. 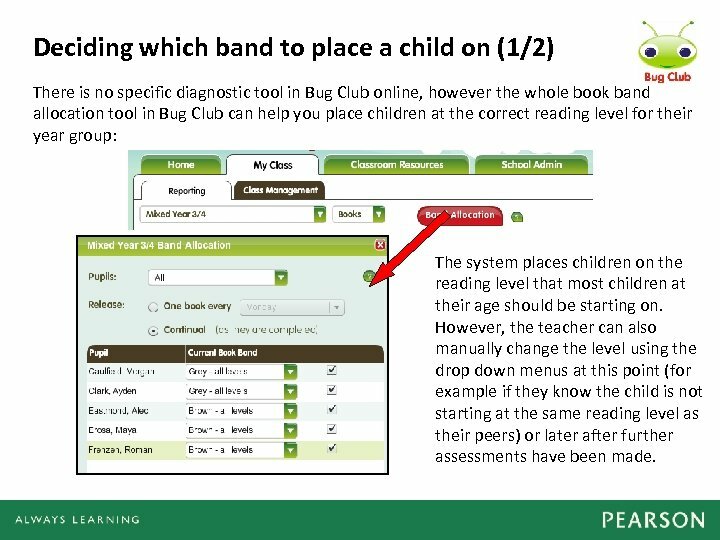 In Bug Club the levels are divided into sub levels A, B (and at lower levels C) to ensure children are supported as they progress. Deciding which band to place a child on (1/2) There is no specific diagnostic tool in Bug Club online, however the whole book band allocation tool in Bug Club can help you place children at the correct reading level for their year group: The system places children on the reading level that most children at their age should be starting on. However, the teacher can also manually change the level using the drop down menus at this point (for example if they know the child is not starting at the same reading level as their peers) or later after further assessments have been made. 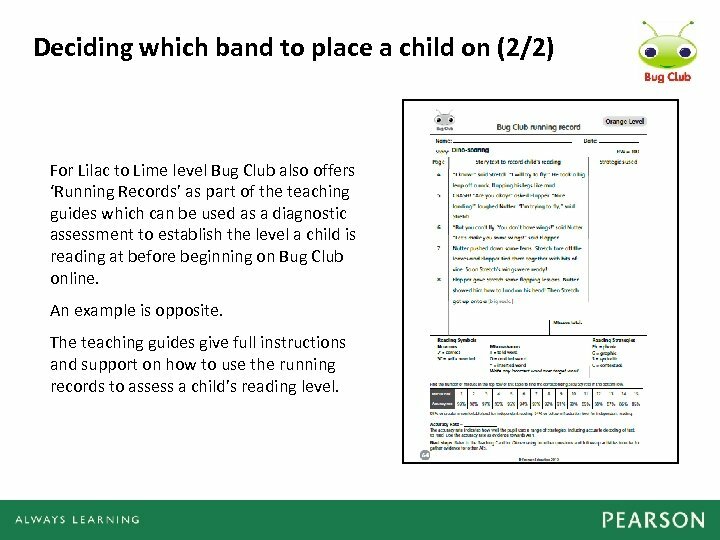 Deciding which band to place a child on (2/2) For Lilac to Lime level Bug Club also offers ‘Running Records’ as part of the teaching guides which can be used as a diagnostic assessment to establish the level a child is reading at before beginning on Bug Club online. An example is opposite. The teaching guides give full instructions and support on how to use the running records to assess a child’s reading level. 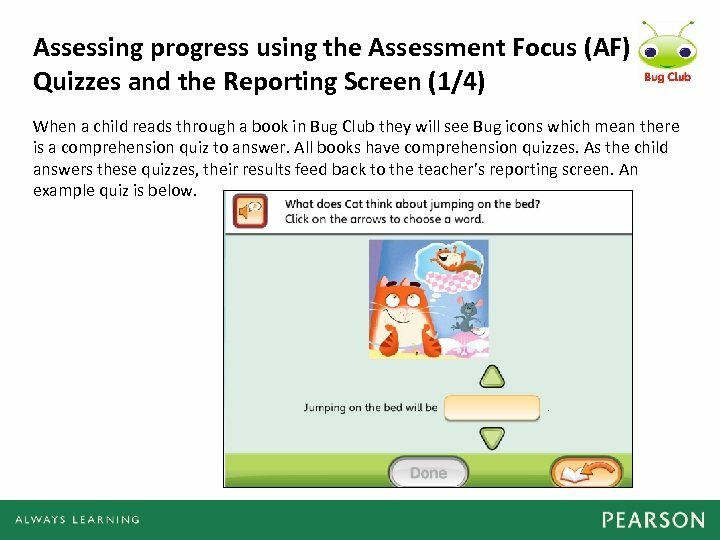 Assessing progress using the Assessment Focus (AF) Quizzes and the Reporting Screen (1/4) When a child reads through a book in Bug Club they will see Bug icons which mean there is a comprehension quiz to answer. All books have comprehension quizzes. As the child answers these quizzes, their results feed back to the teacher’s reporting screen. An example quiz is below. 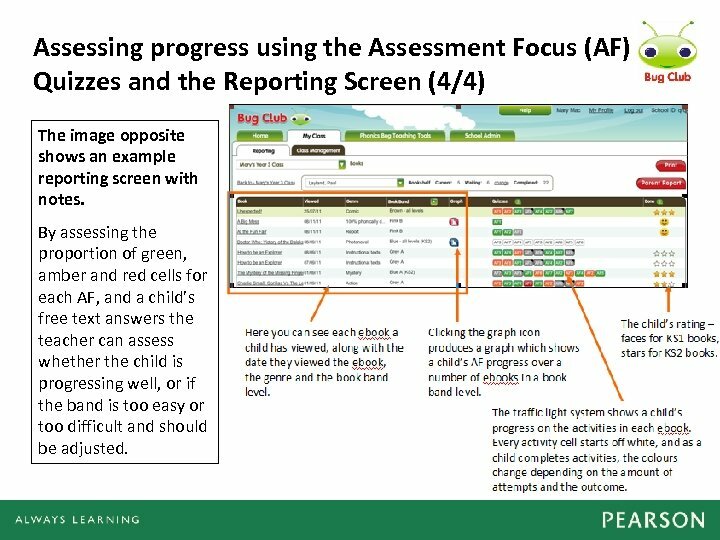 Assessing progress using the Assessment Focus (AF) Quizzes and the Reporting Screen (2/4) Each quiz the child answers is linked to an assessment focus and literacy skill so the teacher can easily identify in which areas a child is doing well or struggling. There are 7 areas of assessment: AF 1 = use a range of strategies, including accurate decoding of text, to read for meaning AF 2 = understand, describe, select or retrieve information, events or ideas from texts and use quotation and reference to text AF 3 = deduce, infer or interpret information, events or ideas from texts AF 4 = identify and comment on the structure and organisation of texts, including grammatical and presentational features at text level AF 5 = explain and comment on writers' use of language, including grammatical and literary features at word and sentence level AF 6 = identify and comment on writers' purposes and viewpoints, and the overall effect of the text on the reader AF 7 = relate texts to their social, cultural and historical traditions. 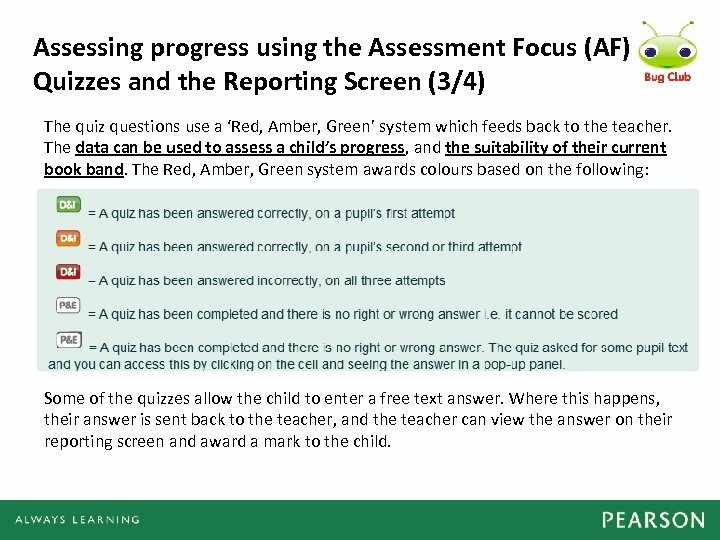 Assessing progress using the Assessment Focus (AF) Quizzes and the Reporting Screen (3/4) The quiz questions use a ‘Red, Amber, Green’ system which feeds back to the teacher. The data can be used to assess a child’s progress, and the suitability of their current book band. The Red, Amber, Green system awards colours based on the following: Some of the quizzes allow the child to enter a free text answer. Where this happens, their answer is sent back to the teacher, and the teacher can view the answer on their reporting screen and award a mark to the child. 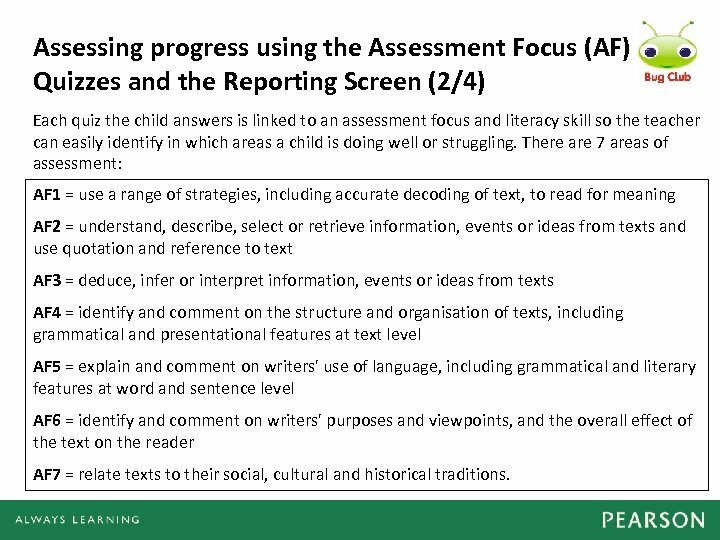 Assessing progress using the Assessment Focus (AF) Quizzes and the Reporting Screen (4/4) The image opposite shows an example reporting screen with notes. By assessing the proportion of green, amber and red cells for each AF, and a child’s free text answers the teacher can assess whether the child is progressing well, or if the band is too easy or too difficult and should be adjusted. 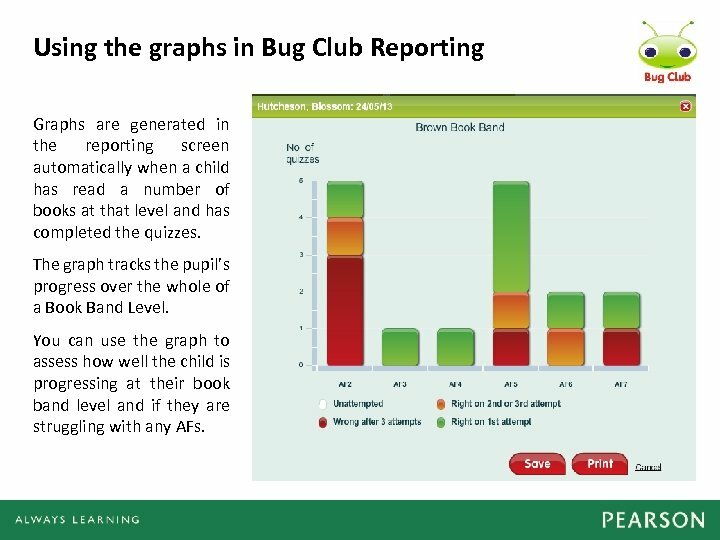 Using the graphs in Bug Club Reporting Graphs are generated in the reporting screen automatically when a child has read a number of books at that level and has completed the quizzes. The graph tracks the pupil’s progress over the whole of a Book Band Level. You can use the graph to assess how well the child is progressing at their book band level and if they are struggling with any AFs. Generating a report for parents By clicking the ‘parent report’ button when you are on the reporting screen for a child you can generate a report which shows: • the child’s 5 most recently read books and their quiz results • the number of books they have read overall • the number of quizzes correct on the first attempt as a % • the child’s current reading level.